It’s never too early to get into a story, and babies are no exception. While babies may not fully understand the concept of a book, it’s important to let them explore and experience books. 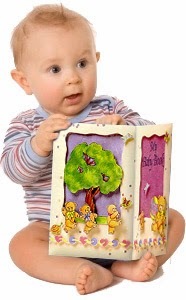 Our Personalized Baby Books build self-image and help babies with their recognition skills as well as leading to an early independent interest in reading! Babies use all of their senses to learn, and letting them experience a book in all of these ways can help your child create a positive relationship with books for life. Just as babies are more receptive to learning languages during their first three years of life, they are also more receptive to reading as well. Children look to their parents for behavioral cues and pick many of them up, especially in their earliest years when parents are their main social connection and teacher. Read to your kids, be an enticing storyteller. Children can learn a lot from vocal cues and no one is immune to a well-told story. Not only that, but parents should read, too. Kids want to do whatever their parents are doing and learn a lot through imitation. Also, have books around the house, baby books, magazines, novels, you name it. Having books available makes books a fixed part of your babies growing world. Remember, babies are exceptionally impressionable. Not only can parents read along with their kids, point to pictures and be effective storytellers, but they can play reading games and use letter cards. While children are learning the language, they can learn how to read it at the same time as well. But remember, be patient. Babies will be babies and they learn best when they explore on their own, building a sense of independence. Don’t get frustrated if your baby loses interest or crawls away, moving around is part of their learning experience. Find the right moments to sit with them and expose them to the wonderful world of reading.